Nigeria international Francisca Ordega says a desire to compete at the highest level explains her loan move to Spanish club Atletico de Madrid Femenino. The forward, 24, has joined on loan until March from United States women's side Washington Spirit. "As a professional you want to continue to improve by competing at the highest level on a regular basis," she said. "Once the opportunity to play for a top side like Atletico Madrid presented itself, I thought why not?" "It's a great honour and I feel very grateful and wonderfully excited," she told BBC Sport. "I just want to settle down here and hopefully make a good contribution." Atletico hosts rivals and joint league leaders FC Barcelona on 29 October, with both teams having won their previous six matches. The much-travelled and vastly-experienced Ordega has previously played in Russia and Sweden before moving to Washington Spirit in March 2015. 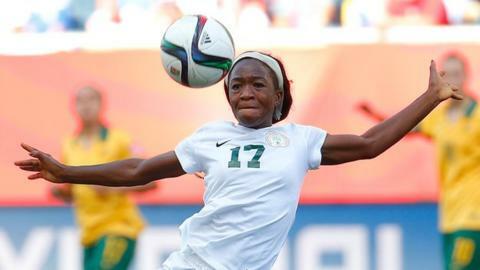 She scored once as she helped Nigeria win an eighth Women's Africa Cup of Nations title last year. Ordega, who has represented Nigeria at all international levels, has 26 caps for the Super Falcons and also boasts experience at two Fifa Women's World Cups in 2011 and 2015.